When Apple called the iPod Touch the "Funnest iPod Ever", it was clear Apple was talking about gaming. But using the touch sensitive screen on the iPod -- and iPad and iPhone for that matter -- isn't necessarily the best way to input commands. Especially for action games like NBA JAM or Madden. Some companies make "joysticks" that try to bridge the gap, but it's still a far cry from having physical buttons like a Nintendo DS. One solution is the iCade, which started as an April Fool's Joke, but was so popular that ThinkGeek turned it into a real product. It's great, but not exactly portable. Now, we have the iControlPad. It's a Bluetooth control pad that's been in the works for more than three years -- and it's finally shipping. While, due to the aforementioned restrictions, the iControlPad can only interface with un-jailbroken iOS devices by way of keyboard emulation, it can interface with other platforms, including Android and WebOS, via the more robust protocols and, thus, deliver its full range of capabilities. Keyboard emulation does allow all other controls on the device to work under iOS — but no analog sticks, which need to send a constant stream of positional data to the host device. 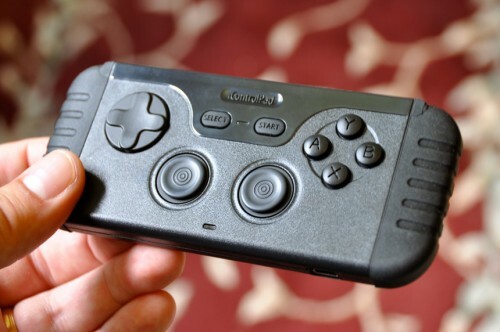 While the iControlPad may be the controller that iOS gamers have been waiting for, the App support isn't quite there yet for non-jailbroken devices. The developers promise iCade emulation support in the future which so far appears to be generating the most App Store support for a 3rd party controller. wow that looks like crap, did someone re-appropriate a 1st gen GameBoy? Last time I checked the original GameBoy didn't have four action buttons, dual analog sticks and Bluetooth. ;) I don't think the design is that bad for a 3rd party accessory. It sure beats a bluetooth chip shoved into an NES controller! Am I the only one bothered by the word, "funnest?" The incorrect use of the word, "fun." Why does it rely on Bluetooth, though? Why not through the dock connector? Who cares how big it is? At least there's something out there that works! They tried many, many different designs and this one is the most universal. Yeah it may be a bit thick, but it works and it's compatible with many different devices. I'm just happy it's finally out, I've been waiting years for this thing!